We have been going to Everett Santa Photos for our Holiday pictures for 4 years now, looking forward to another year in Santa's work shop. I was tired of the boring mall scenes and santas that more often than not looked just as bored. I highly recommend Everett Santa Photo's if you're looking to capture a great memory with a great looking Santa. - Debbie Overholt, Lake Stevens, Washington. We're so happy we found Everett Santa Photo's. Our kids are all grown so the only kid we have left is our dog Rusty. The staff is so patient with our dog and we have gotten some really great pictures of Rusty, some with Santa Claus and some without Santa Claus. I tell all my pet friends about Santa's workshop. They also love working with him, I know you will too. - Joan Lowry, Everett, Washington. Thank You Kylie and Everett Santa Photo's. 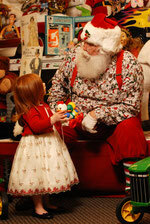 My kids always like coming to your studio to see Santa and Santa's workshop. We have so many compliments on our photo christmas cards, all our out of town friends say they wish they could have a Santa like ours. We know how lucky we are. Thanks again, We'll see you again next year. - Wendy Hull, Edmonds, Washington.